One of the biggest mysteries in astroparticle physics has been the origins of ultrahigh-energy cosmic rays, very high-energy neutrinos, and high-energy gamma rays. Now, a new theoretical model reveals that they all could be shot out into space after cosmic rays are accelerated by powerful jets from supermassive black holes. The model explains the natural origins of all three types of "cosmic messenger" particles simultaneously, and is the first astrophysical model of its kind based on detailed numerical computations, paving a way to further attempts to establish a grand-unified model of how all three of these cosmic messengers are physically connected to each other by the same class of astrophysical sources and the common mechanisms of high-energy neutrino and gamma-ray production. "Our model shows a way to understand why these three types of cosmic messenger particles have a surprisingly similar amount of power input into the universe, despite the fact that they are observed by space-based and ground-based detectors over ten orders of magnitude in individual particle energy," said Kohta Murase, assistant professor of physics and astronomy and astrophysics at Penn State. "The fact that the measured intensities of very high-energy neutrinos, ultrahigh-energy cosmic rays, and high-energy gamma rays are roughly comparable tempted us to wonder if these extremely energetic particles have some physical connections. The new model suggests that very high-energy neutrinos and high-energy gamma rays are naturally produced via particle collisions as daughter particles of cosmic rays, and thus can inherit the comparable energy budget of their parent particles. It demonstrates that the similar energetics of the three cosmic messengers may not be a mere coincidence." Ultrahigh-energy cosmic rays are the most energetic particles in the universe—each of them carries an energy that is too high to be produced even by the Large Hadron Collider, the most powerful particle accelerator in the world. Neutrinos are mysterious and ghostly particles that hardly ever interact with matter. Very high-energy neutrinos, with energy more than one million mega-electronvolts, have been detected in the IceCube neutrino observatory in Antarctica. Gamma rays have the highest-known electromagnetic energy—those with energies more than a billion times higher than a photon of visible light have been observed by the Fermi Gamma-ray Space Telescope and other ground-based observatories. "Combining all information on these three types of cosmic messengers is complementary and relevant, and such a multi-messenger approach has become extremely powerful in the recent years," Murase said. Murase and the first author of this new paper, Ke Fang, a postdoctoral associate at the University of Maryland, attempt to explain the latest multi-messenger data from very high-energy neutrinos, ultrahigh-energy cosmic rays, and high-energy gamma rays, based on a single but realistic astrophysical setup. They found that the multi-messenger data can be explained well by using numerical simulations to analyze the fate of these charged particles. 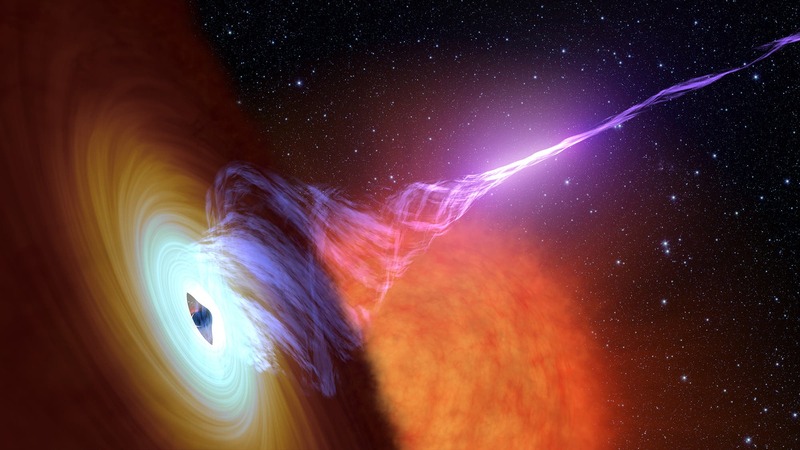 "In our model, cosmic rays accelerated by powerful jets of active galactic nuclei escape through the radio lobes that are often found at the end of the jets," Fang said. "Then we compute the cosmic-ray propagation and interaction inside galaxy clusters and groups in the presence of their environmental magnetic field. We further simulate the cosmic-ray propagation and interaction in the intergalactic magnetic fields between the source and the Earth. Finally we integrate the contributions from all sources in the universe." The leading suspects in the half-century old mystery of the origin of the highest-energy cosmic particles in the universe were in galaxies called "active galactic nuclei," which have a super-radiating core region around the central supermassive black hole. Some active galactic nuclei are accompanied by powerful relativistic jets. High-energy cosmic particles that are generated by the jets or their environments are shot out into space almost as fast as the speed of light. "Our work demonstrates that the ultrahigh-energy cosmic rays escaping from active galactic nuclei and their environments such as galaxy clusters and groups can explain the ultrahigh-energy cosmic-ray spectrum and composition. It also can account for some of the unexplained phenomena discovered by ground-based experiments," Fang said. "Simultaneously, the very high-energy neutrino spectrum above one hundred million mega-electronvolts can be explained by particle collisions between cosmic rays and the gas in galaxy clusters and groups. Also, the associated gamma-ray emission coming from the galaxy clusters and intergalactic space matches the unexplained part of the diffuse high-energy gamma-ray background that is not associated with one particular type of active galactic nucleus." "However, there also are other possibilities, and several new mysteries need to be explained, including the neutrino data in the ten-million mega-electronvolt range recorded by the IceCube neutrino observatory in Antarctica. Therefore, further investigations based on multi-messenger approaches—combining theory with all three messenger data—are crucial to test our model." The new model is expected to motivate studies of galaxy clusters and groups, as well as the development of other unified models of high-energy cosmic particles. It is expected to be tested rigorously when observations begin to be made with next-generation neutrino detectors such as IceCube-Gen2 and KM3Net, and the next-generation gamma-ray telescope, Cherenkov Telescope Array.